Since 2012, Melissa Duncan has raised more than $120,000 talking to alumni and friends of OSU. If you're an Oklahoma State University alumni or friend, more than likely a Cowboy Caller has contacted you. The Cowboy Calling program has a long history at OSU. Once housed in the top floor of the Student Union, students have been calling alumni, parents and friends since 1979 to update records and ask for annual support for OSU. No longer are the days of dialing a phone by hand and writing down pledges on pieces of paper. 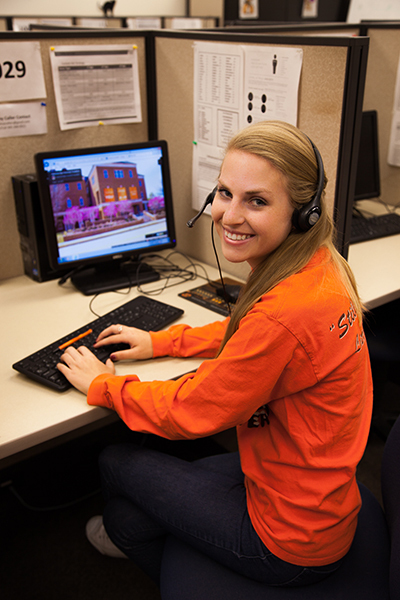 Today, the call center's home is at the OSU Foundation, with modern-day computer and software systems allowing each student caller to focus on building a relationship with the OSU family on the other end of the phone line. The Cowboy Callers serve as Oklahoma State's public voice, playing a vital role in establishing and maintaining a strong relationship with members of the orange-and-black family. They are often the only contact potential donors have with the university. Student callers work 10 months a year, six days a week to seek funding for OSU's greatest needs. "The Cowboys Callers are an essential part of the OSU Foundation," says Beth Farrow, program center manager. "They reach more alumni and friends, which are people who gave toward the university but didn't attend the university, then any other entity within the Foundation. They ultimately make sure that we are gathering funds by asking for donations." Comprised of around 70 student fundraisers, this enthusiastic group focuses efforts on academic and financial student support. Six part-time student supervisors manage the part-time student callers who can make up to 5,000 phone calls in one night. Melissa Duncan and Zach Tomlinson are two of those supervisors who have made a huge impact on OSU and on future students they will never know. Together they have raised more than $260,000. With the help of Duncan and Tomlinson, the Cowboy Callers exceeded last year's goals and are already more than $100,000 over for this year's goals. "I'd be lost without the two of them," Farrow says. "They have been absolutely essential." 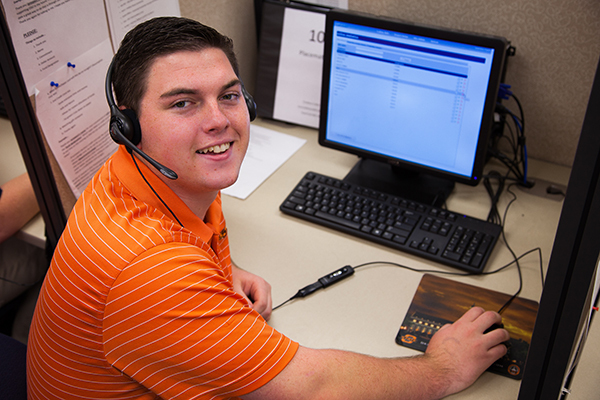 Duncan, a mechanical engineering major from Oklahoma City, began working as a Cowboy Caller in the fall of 2012 and is responsible for raising more than $120,000. "People don't realize how much the university depends on the Cowboy Callers," Duncan says. "They just think that tuition pays for OSU's expenses, but it takes a lot more so that future generations can continue to see their campus grow." Tomlinson, a marketing major from Allen, Texas, has been working as a Cowboy Caller since the fall of 2013 and is responsible for raising more than $140,000 in total. "Getting the opportunity to talk with so many different alumni of all ages, and listening to what Oklahoma State used to be like and how the campus has changed over the years, is always interesting," Tomlinson says. The program is donor-focused with Cowboy Callers trying to help people find ways to support their orange passion at OSU. Although the callers focus on specific programs from time to time, a big effort is seeking out what individuals care about and how their contributions can be matched with their own interests. "In the fall, we were emphasizing Homecoming," Farrow says. "We will be doing a push for KOSU, too. It'll end up being a week or two calling for them." Zach Tomlinson is responsible for raising more than $140,000 as a Cowboy Caller. In 2010, the OSU Alumni Association began fundraising for the $3 million Homecoming and Student Programs Endowment Fund. Once completely funded, the endowment will ensure future generations of Cowboys are able to experience "America's Greatest Homecoming Celebration" as it is known today. Today, OSU has the nation's only remaining "walkaround" component tied to its homecoming. Alumni say they want Walkaround to continue, and Cowboy Callers are a voice on the line to preserve traditions for the next generation. Homecoming costs more than $250,000 per year to celebrate. Gifts to the Homecoming and Student Programs Endowment Fund ensure rising costs do not reduce annual events. As more funds are raised toward the endowment's $3 million goal, additional support will be provided to each living group during future Homecoming celebrations. "If a Cowboy Caller reaches out to you, we hope you will answer," says Amanda Davis, the OSU Foundation's associate vice president of annual giving. "You will have a great conversation with a hardworking student and an opportunity to support your orange passion."